Victorious Grand National trainer Dr Richard Newland followed up his Aintree success on Saturday with a double at Market Rasen on Sunday. But he needed a helicopter ride to ensure that he would make the 152-mile journey on time from his Worcestershire yard to the Lincolnshire course. No such thing as Superstition? Pineau De Re's groom Milly Murray ensured that the fates were on the side of Pineau De Rea, by making sure that she got the same pre-race stable box used by 1986 winner West Tip, the last Worcestershire-trained winner of the race, by Michael Oliver. Irish-trained Monty's Pass, the 2003 winner, was also briefly stabled at Oliver's Worcestershire yard - and wore a brow-band, similar to the one worn by West Tip, for luck. To add to the mix, West Tip, Monty's Pass and Pineau De Re all won the National at Aintree on the same date - the 5th of April. And he had to make the booking two days before Pineau De Re's win at Aintree. "I booked it on Thursday. 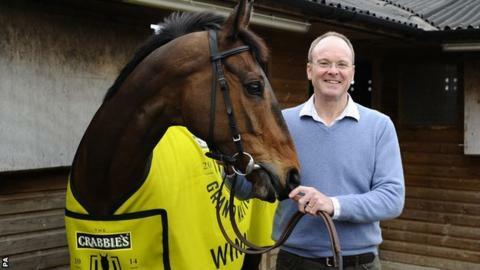 And I had to explain it was dependant on our horse winning the National," said Dr Newland. "I've never flown in a chopper in my life before," he told BBC Hereford & Worcester. "But I'd heard a story about AP McCoy doing it the day after he won the National in 2010, so that he could pick up some rides the next day. "All they'd done when they took the booking was to ask me the name of the horse. "And, when I rang straight after the race, to confirm the booking, they said 'don't worry, it's all fine and we've all backed it too'." The investment in the helicopter ride proved worthwhile when Dalmo, the 13-8 favourite, made all the running to hose up in the opener, a Lady Riders' Selling Handicap Hurdle ridden by amateur Ali Stirling. To stop the horse getting excited by the noise of the packed Aintree crowds before the race, the groom used earplugs. Pineau De Re took the hint and went to sleep in his box. Newland, 50, who co-owns Pineau De Re with close friend Chris Provan, then had Saturday's National-winning jockey Leighton Aspell on board the odds-on 8-11 favourite when he enjoyed another victory in the Novices' Chase on Ardkilly Witness, a horse owned by the trainer's cousin Chris Stedman. As to the yard's plans for 11-year-old Pineau De Re, Dr Newland admits that he has one eye on the great three-times winner Red Rum's achievement of triumphing in back-to-back Nationals in 1973 and 1974. "It's not lost on me that the last horse to win the Grand National back to back was Red Rum," added the former GP, who has just 12 horses in his hard at Claines, on the outskirts of Worcester. "We have to find out what the handicapper does to him. There have been nine 12-year-old Grand National winners since World War Two. Kilmore (1962), Team Spirit (1964), Highland Wedding (1969), L'Escargot (1975), Red Rum (1977), Ben Nevis (1980), Little Polveir (1989), Royal Athlete (1995) and Amberleigh House (2004). "In the last 13 years, no Grand National winner has won another single race since. "Lots come back and run good races but it's almost as if they've had their career-defining moment. "When you've got a horse like this, there's not many races you can line him up at. "But, if he's sound and well, then we definitely aim to run him next year." As the 11-year-old's connections debate over whether to go for the National next year, they will be aware that the there have only been 13 winners of 12 years or older in the official 175-year history of the race.